Keeping your dishes, glassware and flatware clean is an absolute necessity in any size food service operation. For most larger operations, that means a commercial dishwasher. We have a fantastic selection of various types of conveyor dishwashers, glass washers, under counter dishwashers, as well as single and double rack dishwashers to meet your every need. Turn your guests into repeat customers with the cleanest dishes, glasses and flatware you can offer. We have partnered with American Dish Service (ADS) to provide you with the most efficient and reliable warewashing equipment available. 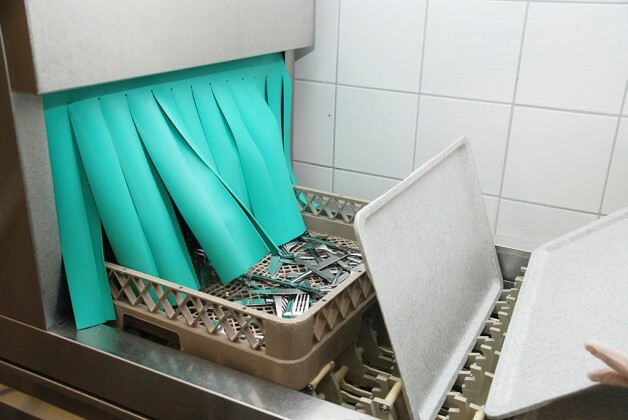 American Dish Service has been manufacturing dish machines for more than 45 years, and have developed patented technologies, that have brought their machines to the forefront of the industry. When you become the owner of an ADS machine, you will bring with it, additional efficiencies and savings. These machines provide savings by reducing electricity, water, and chemical consumption. ADS machines will also offer you savings in labor, as they are very easy to clean and they have minimum down time. Chemicals Sanitizers, Detergent, Rinse Aids, and more. Equipment Glasswashers, Bakery Dishwashers, and more. Maintenance Reduce Downtime, Control Expenses, and more. Safety Rack Dollies, Dispenser Units, and more. Training Best Practices, Bilingual Trainers, and more.